Download free wave PowerPoint templates and ripples Purple PowerPoint Template for Microsoft PPT presentations. This free PowerPoint template has a wave style and is compatible with Microsoft PowerPoint 2007 and 2010. You can download free waves and ripple slide design for your presentations and decorate it with nice pictures and charts. Ripples Blue PowerPoin Template is a free wavy PowerPoint template design that you can download for Microsoft PowerPoint presentations. 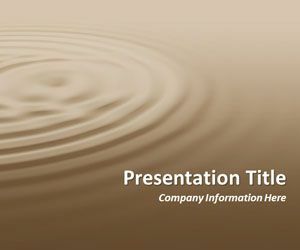 This free wavy PPT template contains a master slide with water waves effect and space for presentation title. You can download free ripples PowerPoint backgrounds for Microsoft PowerPoint 2007 and 2010.